Ropeblock’s tireless dedication to Smart Engineering recently led to the introduction of a range of thoroughly optimized ramshorn hooks. These next generation EN13001-3-5 compliant hooks were designed to significantly increase efficiency as well as enhance durability and operational safety. 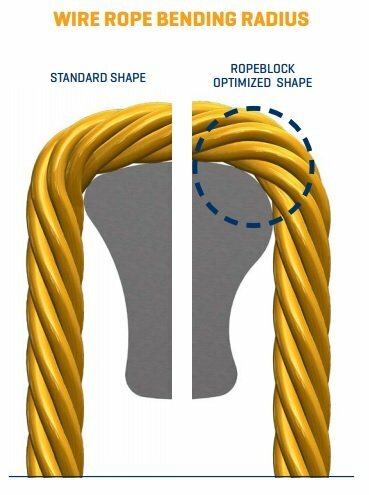 By increasing the bending radius in the sling zone , the new EN13001-3-5 compliant hook design significantly increases the working efficiency of slings and grommets. The improved Ropeblock hooks enhance sling and grommet durability by reducing wear, while causing less reduction of sling and grommet capacity. The new ramshorn hookbody geometry meets or exceeds the EN and DIN standard strength while the shape still allows it to work with traditional hardware. All in all a safer choice for any application.